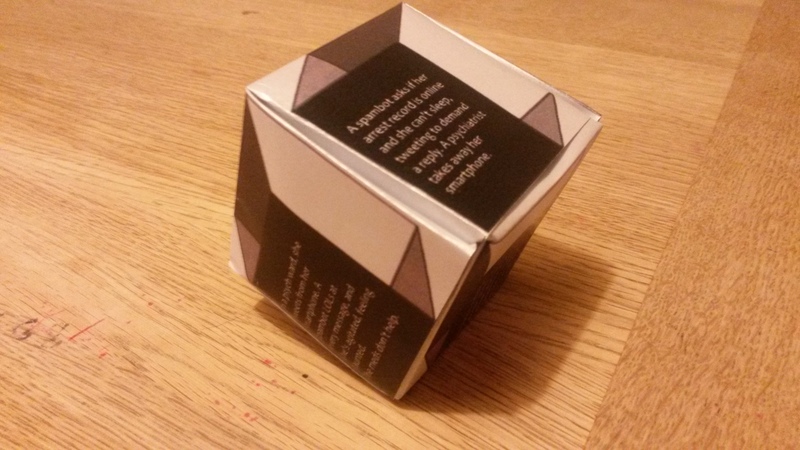 Self assembly silver origami text cube. Buy now for £1.50 within the UK or £2.50 elsewhere. Both prices include postage. Twitter spambots are automated accounts that respond to users with follows, retweets, and replies. Spambot Psychosis is a collection of six microfiction stories about a woman who believes there are humans behind the interactions. Illusion permeates the cube design, which is not yet a cube, but two sheets of paper waiting to be transformed into another reality. Fold the paper using a simple origami technique. No special knowledge, cutting, or glue is required. After it becomes a cube, what secrets does it hide? To learn how to fold the origami cube click here. S. Kay is a Canadian microfiction author with over 200 very short stories published on Twitter lit zines including @Nanoism, @7×20, @TwictionAddict, and many more. Stories have also appeared at theNewerYork Electronic Encyclopedia of Experimental Literature, Monkeybicycle, and the anthologies 140 and Counting and On a Narrow Windowsill. A book is forthcoming from theNewerYork Press in 2015. Follow S. Kay at @blueberrio and blueberrio.tumblr.com.